SolarEdge's product range includes optimizers, which provide both optimization and monitoring of solar energy. SolarEdge has created the DC Optimizer segment and is market leader with more than 70% of the market. SolarEdge's DC-AC inverter is specially designed to work with SolarEdge power optimizers. Because Maximum Power Point Tracking (MPPT) and voltage management for each panel is provided by the power optimizer separately, the inverter is only responsible for the DC-AC conversion. This makes it a simple, cost-effective and reliable PV inverter with a standard 12 year warranty that can be extended to 20 or 25 years. The fixed string voltage ensures the highest efficiency at all times (>97% average efficiency) regardless of string length and temperature. SolarEdge is the world market leader in the field of smart energy technology. By using first-class technical expertise and a constant focus on innovation, SolarEdge creates smart energy solutions 'that power our lives'. SolarEdge was founded in 2006 and devised a DC-optimized inverter solution that has fundamentally changed the way energy is produced and managed in PV systems. The intelligent inverter solution maximizes power generation at the individual panel level, while reducing the cost of the generated energy for a better ROI. SolarEdge is a leading manufacturer of intelligent inverter solutions and has delivered more than 9.6GW of DC-optimized inverter solutions worldwide. The SolarEdge monitoring platform permanently monitors more than 750,000 PV installations in 133 countries. Since its IPO on NASDAQ in 2015, SolarEdge has continuously shown significant growth in sales and gross margin. The strong financial position and stability of the company, combined with its advanced technology, make SolarEdge the preferred partner of leading installers, integrators and other parties in the energy market. 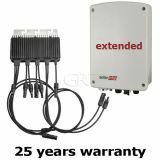 Do not hesitate to contact your wholesaler, GPC Europe, for the purchase of SolarEdge inverters and power optimizers. Suitable for homes with limited roof space, social housing projects, or for meeting minimum sustainability requirements.